Old Silent Inn01535 640792workRestaurant - PubThe Old Silent Inn offers not only fine cuisine but a traditional pub steeped in history - the pub dates back over 400 years. The antiquity and mystique of the Old Silent Inn has inspired several authors to write fictitious novels based upon the pub. In recognition of their great food, the pub has been crowned Best Food Pub at the Great British Pub Awards 2010. The Old Silent Inn offers not only fine cuisine but a traditional pub steeped in history - the pub dates back over 400 years. 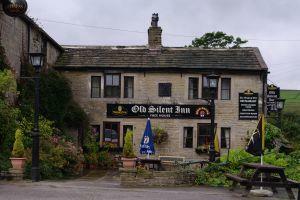 The antiquity and mystique of the Old Silent Inn has inspired several authors to write fictitious novels based upon the pub. In recognition of their great food, the pub has been crowned Best Food Pub at the Great British Pub Awards 2010.